Today 2012 draws to a close. It was a tough year in many ways, but it was also filled with God's goodness and blessings. Life is like that. And the trials will always remain with us until we go to be with Christ. It's part of His plan. In our humanness, we seek to ease our pains, remove our trials, extinguish all evil. We chase after it and seek solace in so many things that only prove to disappoint... not just drugs or alcohol, but in relationships, money, homes, careers, achievements, etc. None of these will ever completely fulfill. No, instead, within them, we often bump into the very thing we seek to avoid... trials and tribulations. Conflict and confusion. We all do it. We all seek that which is beautiful and perfect, a life of ease and void of trials. But we seek amiss. And we know that, too. We know we need God. Jesus. His Holy Spirit. But so often we seek solace in everything but the only One who can satisfy. And let me clarify just a bit... even in seeking God, as long as we remain on this earth, we will only see Him as through a mirror dimly (I Cor. 13:12). Our sinful human nature and the constraints of this finite earth distort our view. Only when we reach heaven and enter that eternal state will we see Him as He fully is. What a glorious day that will be! Friends, I don't know what 2013 will hold. I look at the headlines, read blogs, talk to friends, and meditate... perhaps too much on the wrong thing. It looks scary. Health concerns and financial hardships of the future seem inevitable, but not nearly so frightening as the growing persecution of believers. In my humanness, I want to run back to the past and hide in memories of "better" times and pretend this reality isn't so. It seeks to consume me. 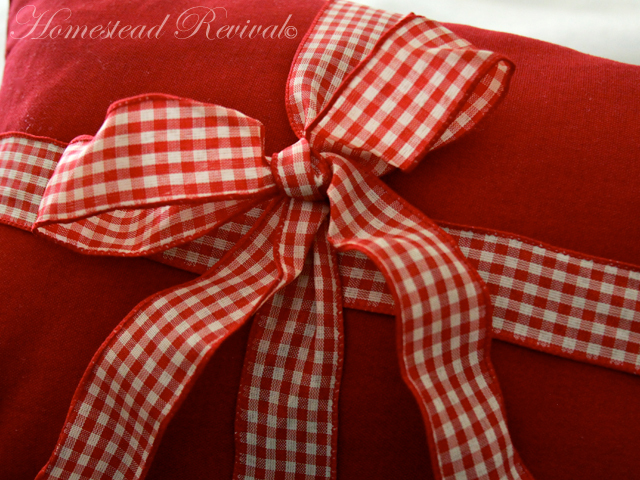 Dear friends, many of you are kindred spirits in that you love homesteading and homemaking. These are good things and worthy of our time and pursuit. But these are finite things. Will you also be a kindred spirit with me even on those things which are eternal... the things which will help us face 2013 like true soldiers of the cross? Will you take up the only armor that will really protect you in the battle against good and evil... the battle we face not as "Americans" but as human beings? 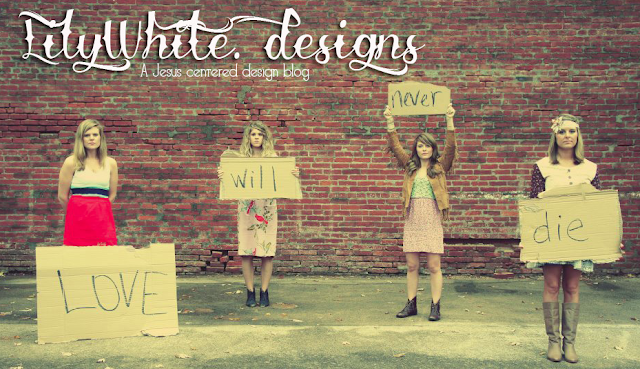 Dear sisters, we will not perfectly achieve our goals. No, we will fall short in some way. I challenged myself to read the entire Bible again in 2012 and I only made it about 3/4 of the way through. Did I fail? NO. I read 3/4 more than I would have and I am that much closer to knowing my Savior better than I did in 2011. Does that mean I'm home free? Not hardly. I'm like an Israelite of old. Without the Holy Spirit, I would/will do what is right in my own eyes (Judges 17:6) and would/will turn to my own ways (Isaiah 53:6). I must hold fast to the Word and My Savior. And I need constant reminders to do so. This post has been for me as much as anyone. I must rehearse these truths over and over so that I don't forget and lose sight of that which is eternal and those things that will carry me through 2013. I pray it does the same for you. How will you cling to God in 2013? Let us encourage one another and share here in the comment section so that we know we are not alone! 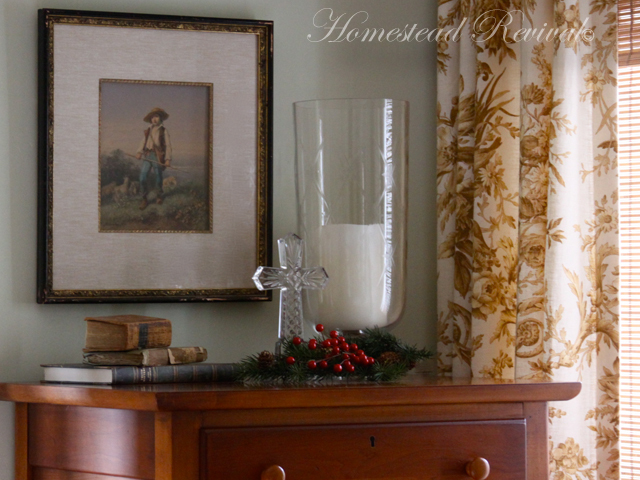 With a red and white theme this year (and a few green, brown, and black accents), these were some of my favorite things that didn't show up on the Farmhouse Christmas Home Tour. And I was finally able to use some of that mismatched flatware I've collected at thrift stores and my French inspired numbered napkin rings for our Christmas Day meal. A bit sad to pack it all up as I've enjoyed it so much. 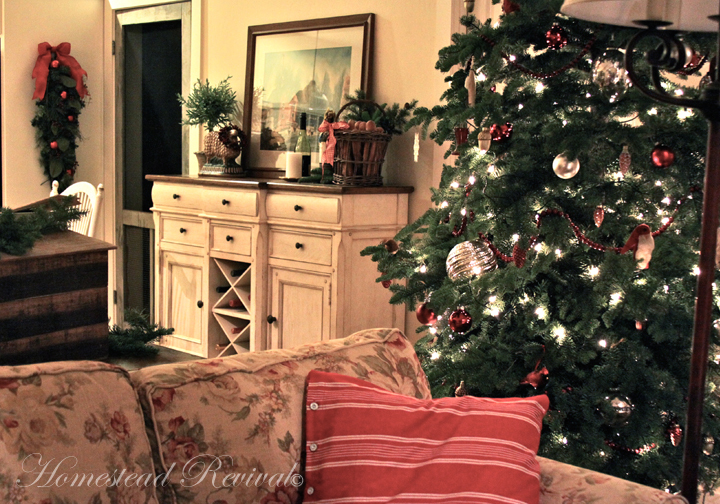 But everything has it's season and now I have a few photos to remind me how I decorated in 2012 (so I can do it again next year, Lord willing). 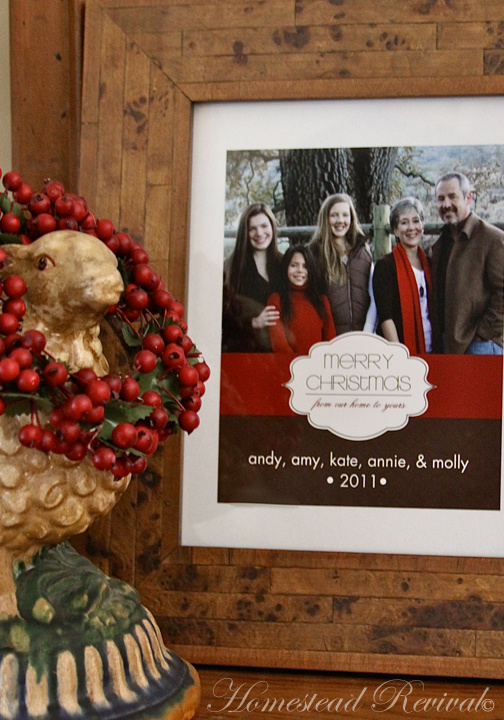 I still enjoy looking at photos of my mom's Christmas decorations and I'm sure my girls will do the same. So don't forget to take a few snapshots of your own home before you put the decorations to rest in the attic. We're so very grateful for every single one of our readers... some new and some who have become friends over the years. 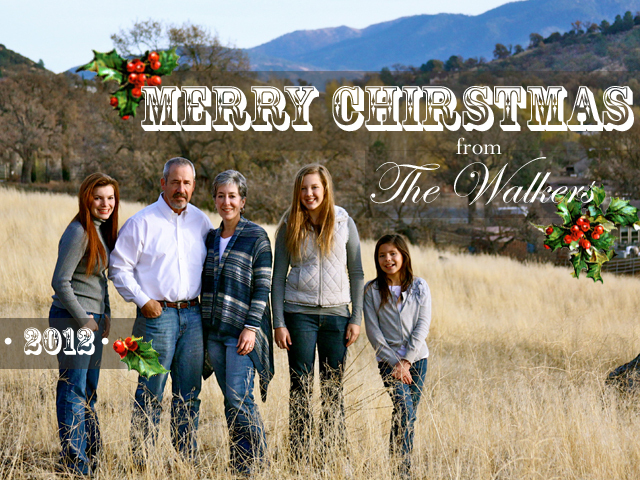 May you have a blessed Christmas and New Year's with family and loved ones who are dear to you. Perhaps because every year that I grow older, my heart aches just a little bit more for Jesus... to see Him part the sky and gather up His beloved into His glorious light. I imagine that's how many of the Israelites felt that holy night so many, many years ago. No... aching for Him to come! Imagine their great joy and the glorious hope that it brought to their hurting hearts when the news reached each village... The Savior has been born! For those who believed it must have meant EVERYTHING! We too hurt... and we search. We long and even ache for Him to come. But be comforted dear one... He CAME and He WILL come again! that where I am, there you may be also." shall reap with joyful shouting. bringing his sheaves with him." 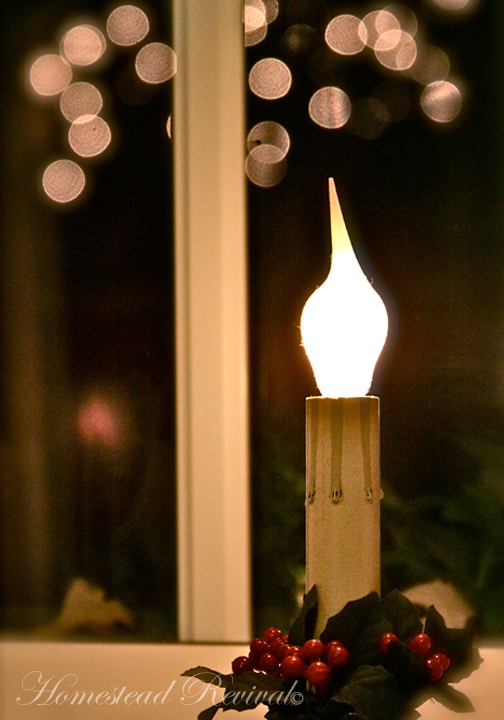 In all the hustle and bustle of preparations, take some time to bask in the Light of Christmas and the hope that He has and is coming! Our King is near! 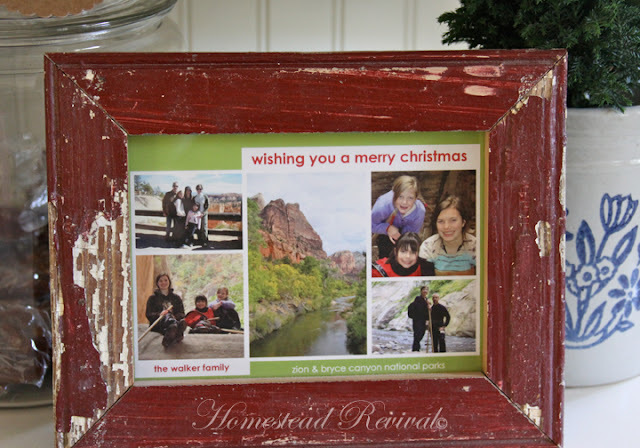 I love getting photo Christmas cards each year. It's often the only time I get to see some of my dear friends that live miles away. And I love looking at our own family cards, reflecting on past Christmas celebrations, and seeing how the family has grown and changed year after year. I haven't had a chance to do them all, but I found the last four Christmas cards and popped them into frames (some old and some new), and spread them around the living room. Each card is unique in it's own way and seems to fit in some special spot in the house. 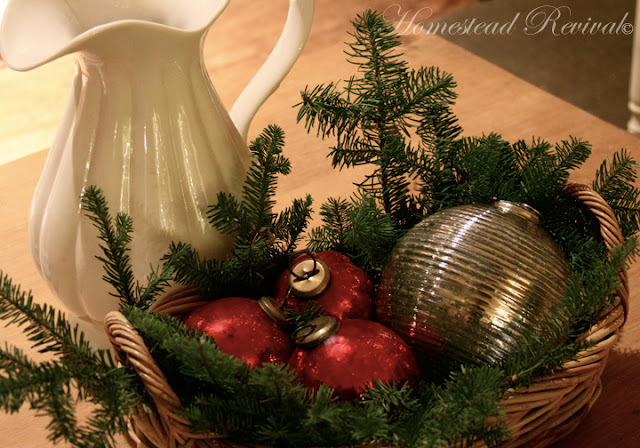 After the first of the new year, I'll gather them up, wrap them in tissue, and tuck them away until next Christmas. But for now, I'm enjoying every second of sweet memories! I can't wait to dig out more cards and place them in frames... this could be my favorite Christmas present to myself in years! If you have some frames that have photos in them, but you've been looking at them so long that you don't really notice the picture anymore, it's OKAY to just carefully switch them out, because you can always switch them back. 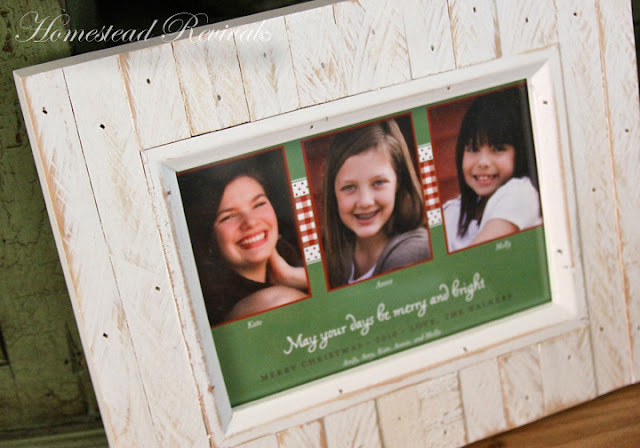 It's a great way to refresh your photos and you'll love how much joy it brings you to see some of those old cards! (And if your photos are getting too much sun, it's good to give them a break so they don't fade as fast!). 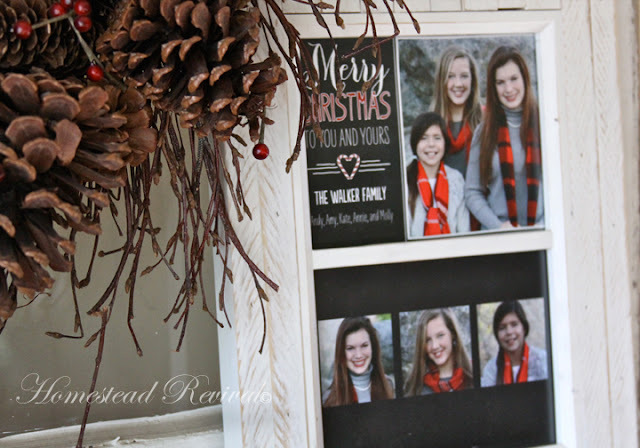 How do you display your old family Christmas cards? 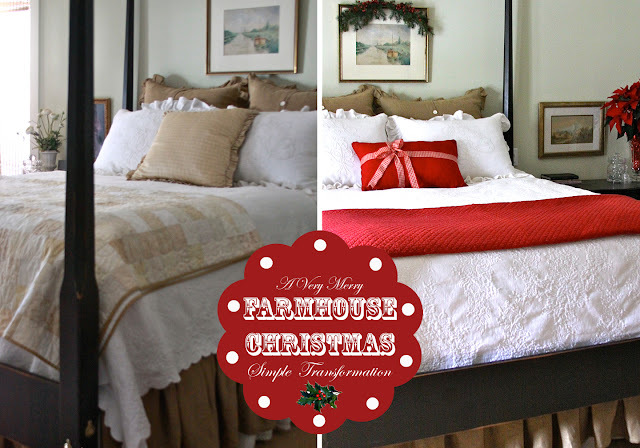 Yes, you too can easily transform a bedroom from everyday into HOLIDAY! Frugally, I might add. Most people pick their decorations FIRST and THEN try to make them fit the room, which is why many find it hard to achieve "the look" they are after. 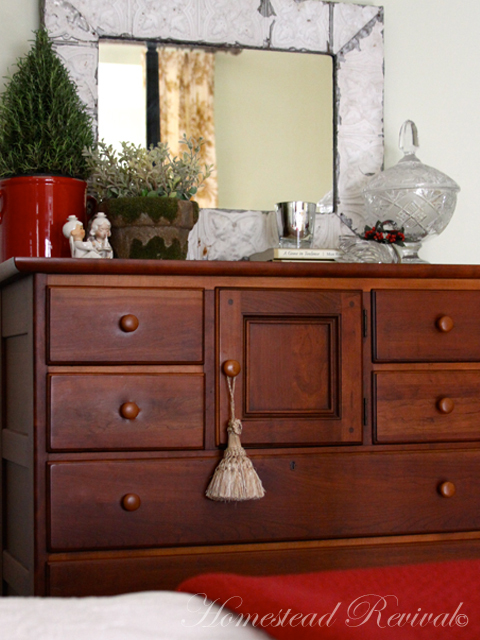 The key is in working with the scheme that already exists in your room and selecting the right accents to switch out. I'll agree... my semi-monochromatic bedroom palette, may make it a bit easier. 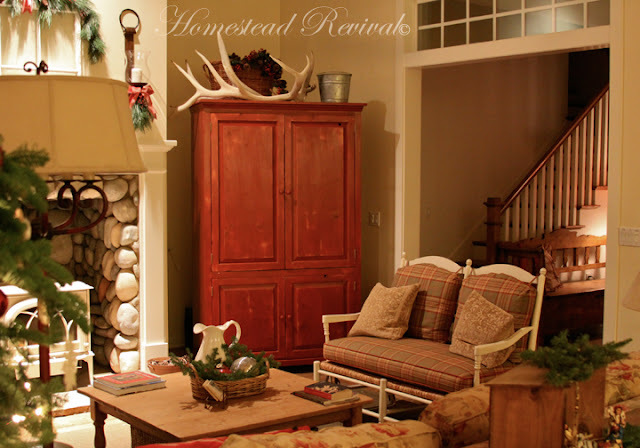 But by removing a few accents and replacing them with something that coordinates, and yet adds a touch of Christmas, you can convert just about any room in the house so that it has a holiday feel. Here's a "before" and "after" side-by-side photo so you can see what the room typically looks like and how it looked afterward (at least the bed, anyway). I only did 4 simple things that impacted the room in a B.I.G. way. 2) I switched out the quilt at the foot of the bed. This one is borrowed, but I'm on the look out for the same quilt. 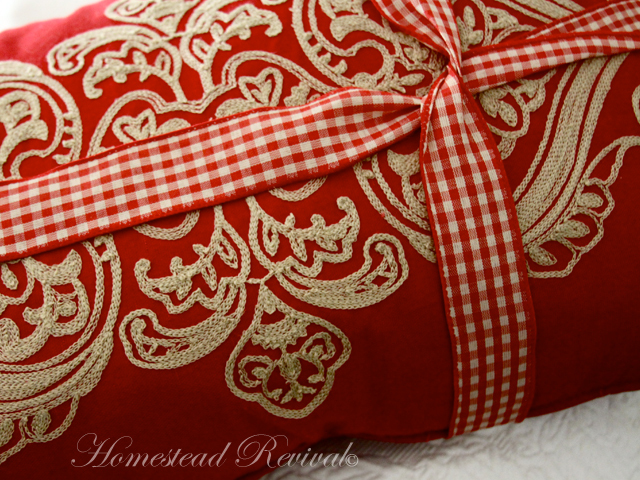 I can see me using a red quilt like this a LOT. 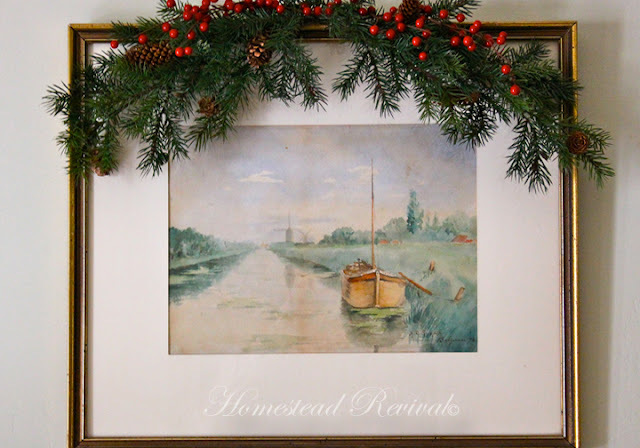 3) I added some greenery to the antique watercolor above the bed. 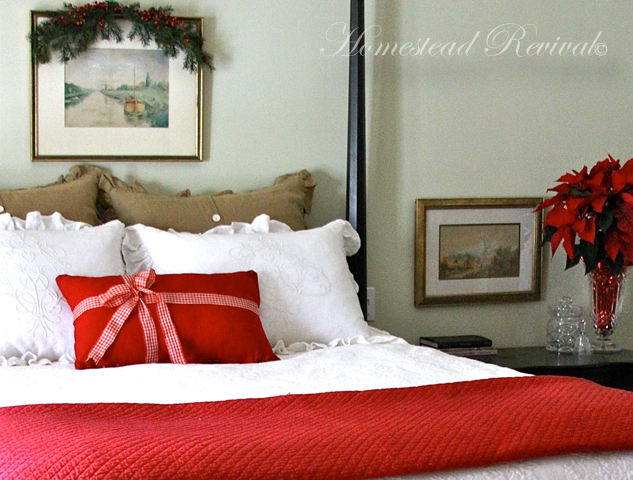 4) I switched out the flowers on the night stand, adding the red Poinsettia and red foil paper. That's it. Nothing more. Can we all agree that this is simple? 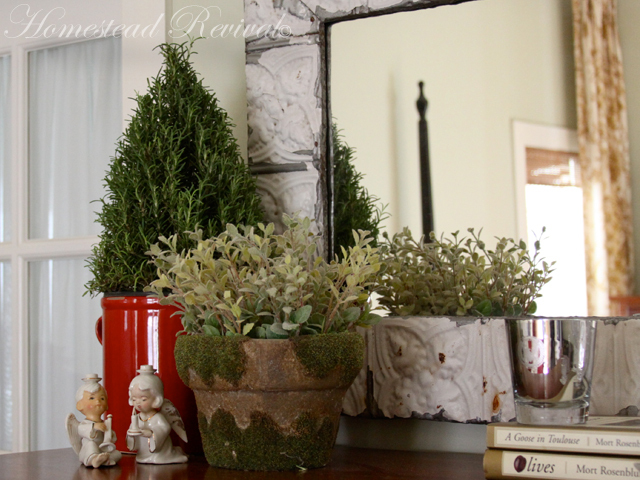 Later I did add some greenery and a couple of things from around the house to the dressers. Oh, and the antique angels of my grandmother's. 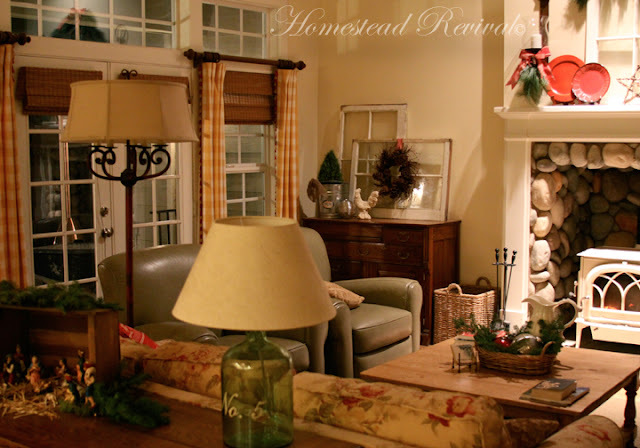 1) Be willing to remove some items so as to keep the room from becoming crowded or cluttered. 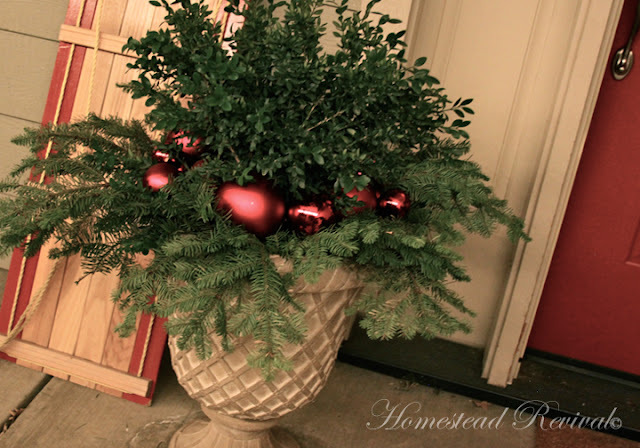 This also helps eliminate items that will distract from the holiday accents you are adding. 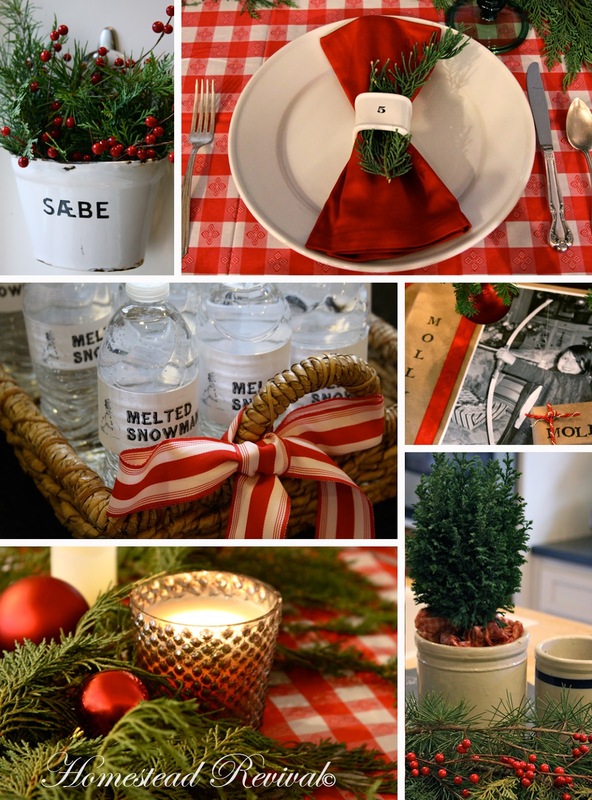 2) Be willing to match the accents to the room, not force holiday decorations that you "like" into a room where they won't work well. 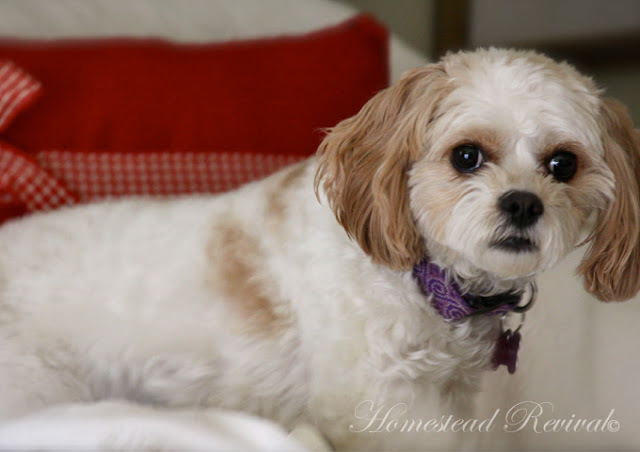 Apparently our little friend, Tiki (visiting for the week), liked the rooms, too. Okay, so maybe it was really just the soft bed and the fact that SHE got to get up on it! Barn Hop #92 "Holiday Edition"
Welcome to the Monday Homestead Barn Hop. 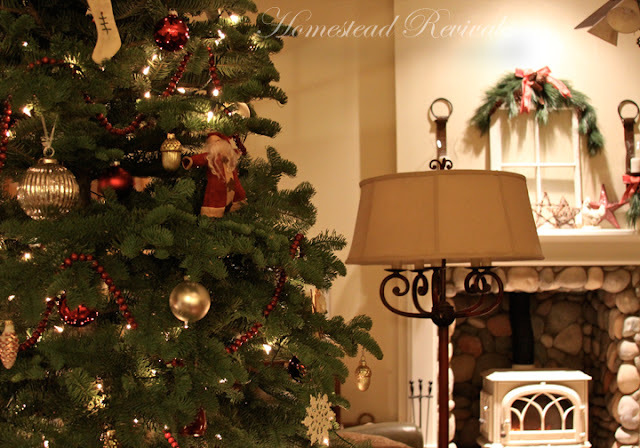 Today, we're linking our favorite Christmas and Holiday posts to share! 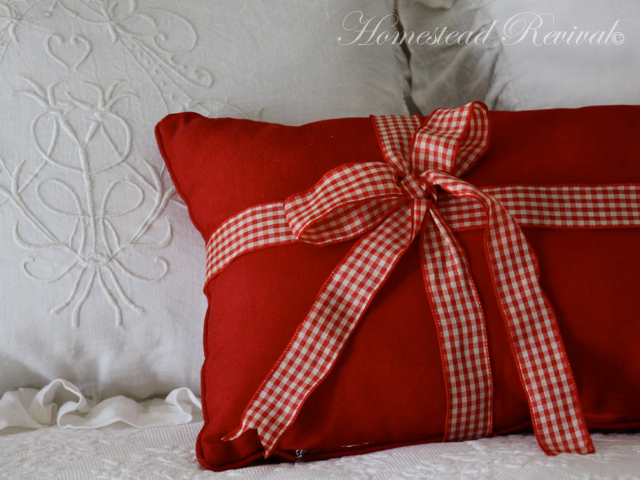 Anything you'd like to share that's related to the season... a recipe, a gift idea, a decorated barn, or even a home tour. Write it up, takes some photos, and join the fun! 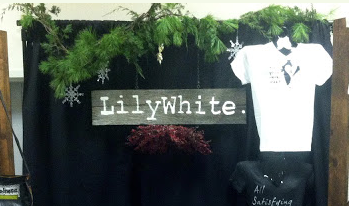 This week I'm featuring Lily White. 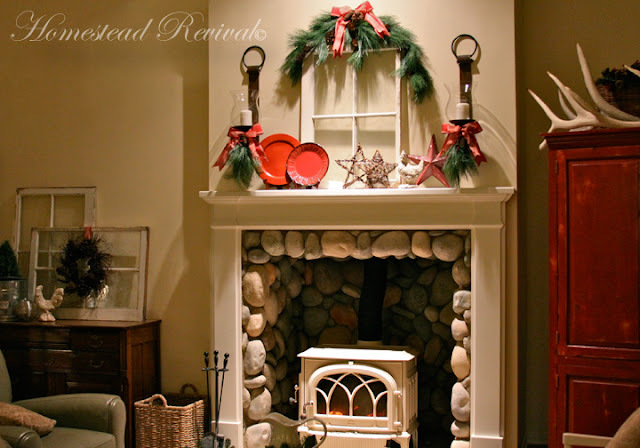 Designs and their DIY Garland tutorial. 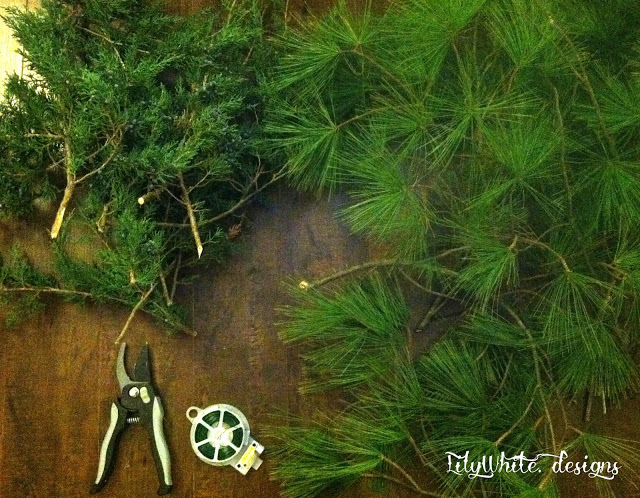 I adore all those natural garlands you see in magazines and on Pinterest, but unless you make them yourself from pine branches locally foraged, they'll cost you an arm and a leg. Now you can make one yourself! "I got the idea in my head that a fresh garland would look super cute hanging from the background. I had seen them for sale at Kroger, but wanting to keep things frugal, I decided to talk Jared into going for a late night walk with me to collect greens! It was super easy to make." Thank you, ladies! This really looks like something we can all do! 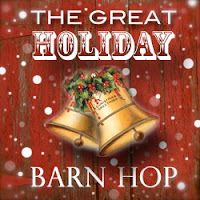 Please note that this is the last Barn Hop for 2012. We'll resume our link up on Monday, January 7, 2013. See you there! Join The Holiday Barn Hop! 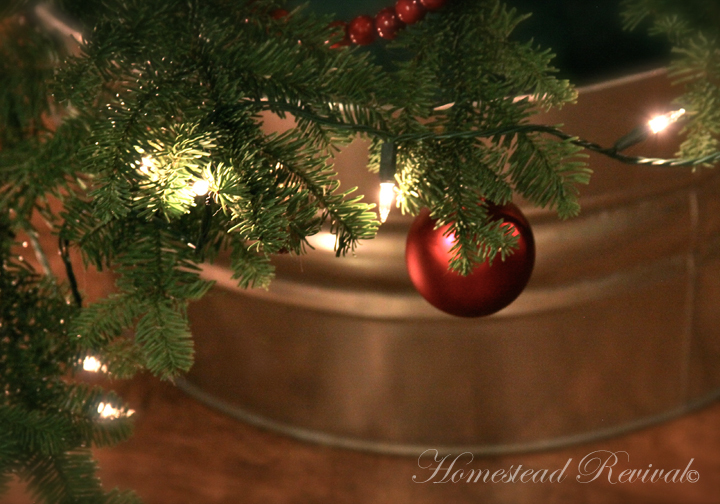 ...invite you to link up and share your Christmas or Holiday homesteading posts! Please remember this is a family friendly link up. Any pictures or posts linked to the hop which aren’t appropriate for our children to view or read will also be deleted immediately. We’re pretty conservative, so we ask that you use good judgment and err on the side of caution. Humor me... I needed to work on my night time photography skills. It would be even better if I cold get off the automatic setting. Working on that. Slowly. S.L.O.W.L.Y. All the same, I thought a night time tour might be kind of fun. But I'll warn you, despite photoshop editing and all, a couple just didn't come out that great. I just couldn't get the color right. I'm learning though! 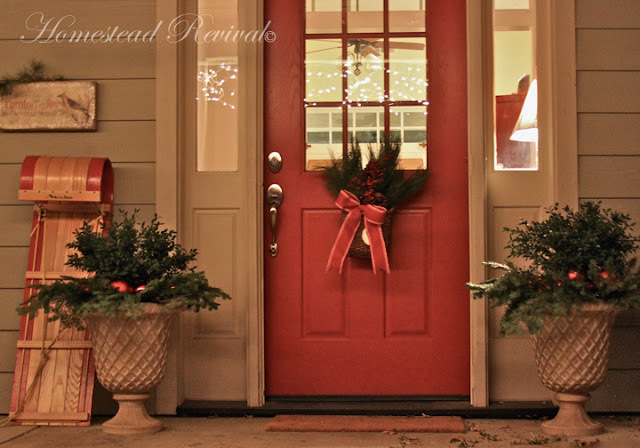 Perhaps you remember I wanted to paint my door red last year? One down, three to go. Yes, there are actually two doors and one set of French doors on our front porch. This one is the main entry. I spiffed up the pots with some greenery and balls and added one of the kids sleds and a sign I picked up this year. 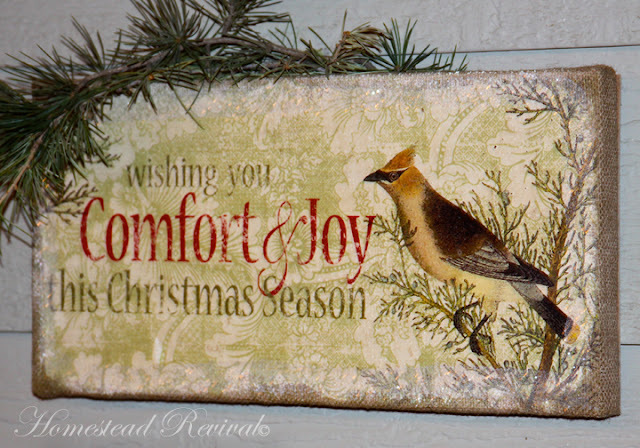 I had know idea that the phrase would have such deep meaning for Christmas 2012... seems like we can not get away from the obvious fact that we all need some "comfort" as well as "joy" this year. So thankful we can find that in our Savior! Next is the entry hall. I didn't get the stair rail decorated this year (can't do it all). But I did get a couple of red pillows on the antique German bench to match the red checked lamp shade. That's about it in here. I hope to add something else before a church College party on Friday night. 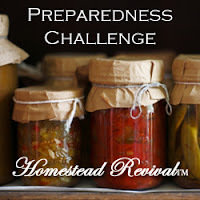 I keep seeing that old galvanized pail... EMPTY. Needs some greenery! But I'm LOVING the elk antlers. Why didn't I use them years ago? and on around to the the tree! 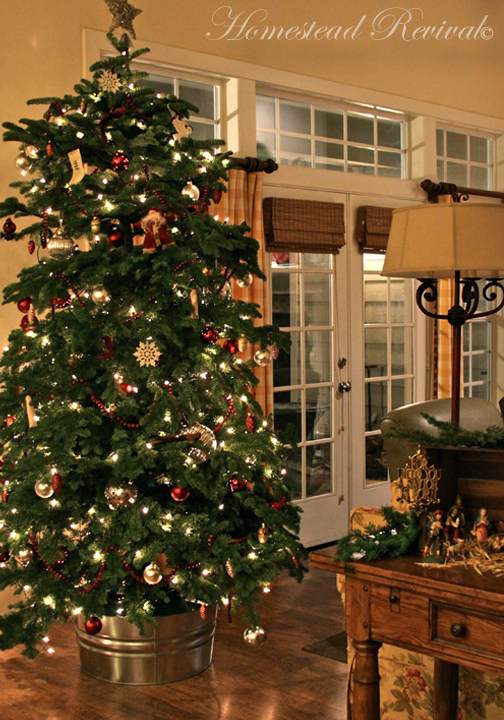 We opted for a cut tree this year... a noble fir. The stand is in a large galvanized wash tub, which really makes keeping it watered a breeze! 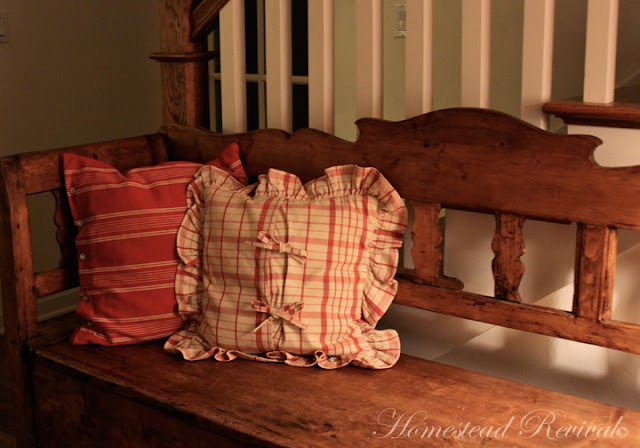 Before the party, I might add some burlap inside. And finally around to the mud room, pantry, and kitchen. Perhaps I'll take some pictures of the kitchen and post those soon. 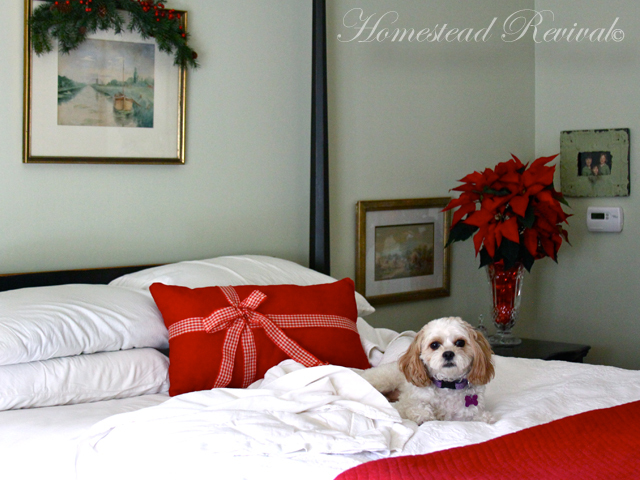 But tomorrow, I hope to show you the master bedroom. (For more details on the main room, you can read my earlier post here.) We'll see how far I can get through the house before Christmas arrives. 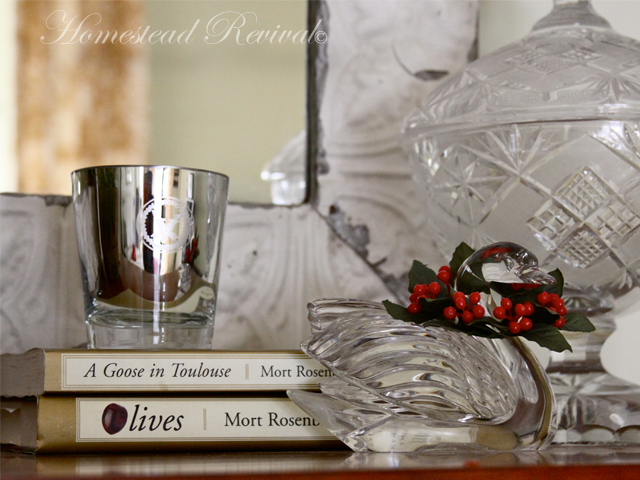 Hope you're enjoying some cozy days making sweet memories with your families in your own home this year. There will only be one Christmas 2012. 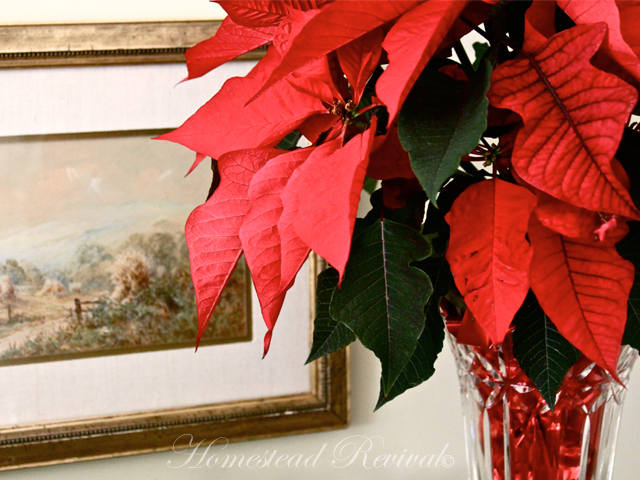 See more great Christmas Home Tours HERE! 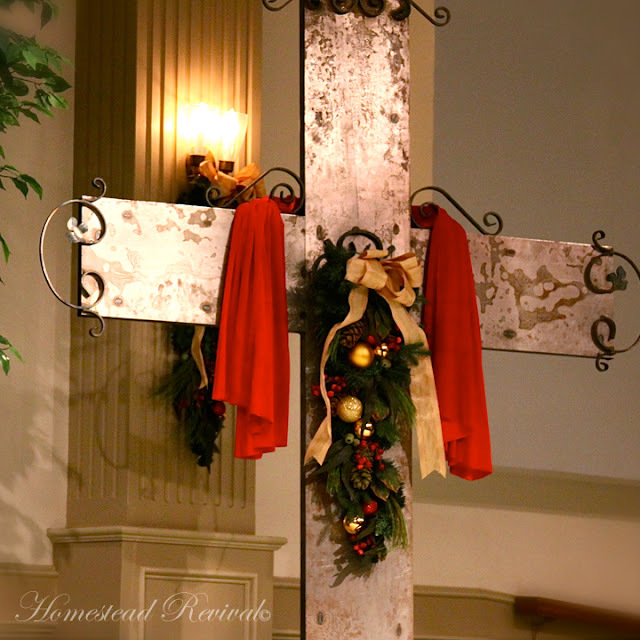 What is Christmas really for? Simple Cookies with Big Flare! Preparedness Challenge 2012 Grand Finale!